In this video we will discuss Angular component lifecycle hooks. To tap into and react when these life cycle events occur, angular offers several lifecycle hooks as shown in the image below. Step 1 : Import the Life Cycle Hook interface. For example, to use ngOnInit() life cycle hook, import OnInit interface. Step 2 : Make the component class implement the Life Cycle Hook interface, using the implements keyword as shown below. This step is optional, but good to have so you will get editor support and flags errors at compile time if you incorrectly implement the interface method or make any typographical errors. Step 3 : Write the implementation code for the life cycle interface method. Each interface has a single hook method whose name is the interface name prefixed with ng. 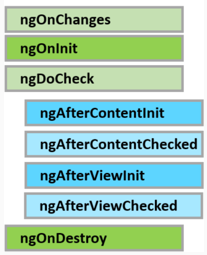 Let's understand ngOnChanges life cycle hook with a simple example. Here is what we want to do. As soon as the user starts typing into the text box, we want to capture the current and previous value and log it to the browser console as shown below. We can very easily achieve this by using the ngOnChanges life cycle hook. ngOnChanges, is called every time the value of an input property of a component changes. So first let's create a SimpleComponent with an input property as shown below. We will continue with the example we worked with in our previous video. Add a new folder in the App folder and name it Others. Add a new TypeScript file to this folder and name it - simple.component.ts. Copy and paste the following code which is commented and self explanatory. At this point run the application and launch browser developer tools. As you start typing into the text box, the changes are logged to the console by the ngOnChanges life cycle hook method. The steps for implementing the other component life cycle hook methods are very similar. Do the ngOnChnages always accepts the SimpleChanges type parameter or it has to do something with component name? It got it. SimleChanges is the object provided by the angular framework that represents the basic change from a previous to a new value.